with The Mafia & Fluxy Band. The minute you hear Eek A Mouse (real name Ripton Hilton), you never forget him. Eek A Mouse sent the dancehalls raving in 1979 with his very DJ single; that Joe Gibbs produced “Once a Virgin”. I can imagine anyone not being intrigued by his nasal high-pitched voice and “biddy beng-beng, biddy meng-meng” scatting, though. This vocal style alone would set him apart from the pack of veteran DJs, but what truly elevates him above the rest is the quality of his melodies and music. Though generally considered a DJ, his style is distinctly Singjay. He's utterly unique, which is hard to say of an artist in any genre. 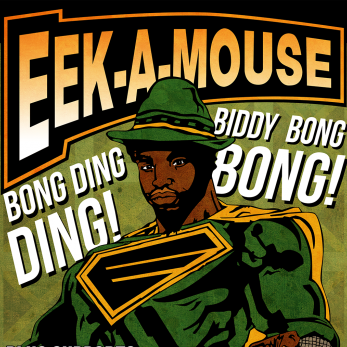 Eek A Mouse's style is just plain fun to hear, as in the wonderfully playful "Peeni Walli" or the hit "Wa-Do-Dem”. His 1988 album Eek-A-Nomics saw him begin to establish himself with an international audience, spawning a club hit with “The Freak”, and he was signed by Island Records in 1989. He returned to prominence with 1991’s U-Neek album, which continued the rock-oriented style, including a cover version of Led Zed Zeppelin’s “D´Yer Maker”, and from which the hit single “You Are The One I Need” was taken. Eek A Mouse also has performances in the 1991 gangster movie New Jack City as Fat Smitty alongside movies stars like Wesley Snipes, Ice-T, Mario Van Peebles, Chris Rock, Allen Payne, and Keith Sweat among others. Though he continues to toil in cult obscurity, reggae singer Eek-A-Mouse remains one of Jamaica's most individual talents. Come and capture the legendary rude boy live, performing classics like "WaDo-Dem", "Terrorists in the City," "Anarexol." “Virgin Girl” and quality exposure to a true character.